Using the right computer monitor might be the difference between a good presentation and a great presentation. LG offers dozens of innovative options to help you make the right impression, including 3D monitors that bring two-dimensional images to startling reality, IPS monitors with wide viewing angles and virtually no color shift, slim LED monitors, and ultra widescreen monitors that can be split into up to four windows for the ultimate in multitasking. 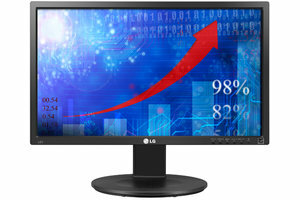 Explore our full range of LG computer monitors, as well as our newest computer accessories, and create a space that's as functional as it is stylish. dimensions 13.5" x 22.4" x 2.5"
Reader Mode provides optimal conditions for reading by reducing blue light helping to protect your eyes. With just a touch of a button, you can comfortably read on the monitor for extended periods of time. Flicker-Safe new dimming technology is applied to minimize the flicker level that causes eye fatigue. With almost-zero flicking, watching for long periods of time is easy and comfortable. SUPER+Resolution technology helps to detect rough edges and blurring in of content when enlarged, offering improved quality with a better sense of high resolution. Extend the protection on your LG products for up to three years with LG Premium Care. Copyright © 2009-2017 LG Electronics.